The District's a very branchy sort of line, with trains shuttling off in all sorts of directions. But until 1959 there was another branch line, a stumpy little curve heading less than a mile through Acton. Whatever were they thinking? There'd not seem to be much call for a train between Acton Town and South Acton. The area's built up, but not excessively so, and who'd genuinely want to get from one to the other? But the first railway line here wasn't for passengers, it was for freight, opened in 1899 with the sensible idea of linking the District to the North London Railway. Passenger services began in 1905, with trains running up from Hounslow through Acton Town and along the spur to South Acton. Here you could change for services down to Richmond or up to Willesden Junction, rather than have to change trains twice round the Gunnersbury Triangle to get to your destination. It wasn't busy. World War 1 halted services, and when trains restarted they ran only one stop. By now the line had been disconnected from other the services at Acton Town and also reduced to a single track. The trains that shuttled back and forth had only one carriage and no guard - indeed they were the first driver-only operated services on the London Underground. Drivers knew this as the "Tea Run", because it's said they could start a kettle going when they set off from Acton Town and still get back again in time before it boiled. And this charade continued until 28th February 1959, when dwindling passenger numbers finally led to the line's permanent closure. South Acton station still exists, but now only on the Overground. And it's still a very quiet station, with barely half a million passengers a year, because there are all sorts of other Acton stations nearby with better services to more useful places. Trains whirr in from Richmond or Stratford or wherever, and not many people get out and melt away into the surrounding streets. A small canopied building on the northbound platform is the only hint of the station's Victorian history. Indeed, look down from the footbridge spanning the tracks and the platforms and their surroundings look surprisingly modern. 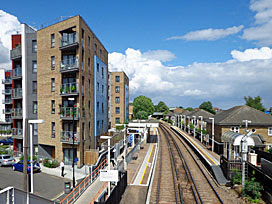 That block of flats immediately behind the station in particular, they're a 21st century intrusion, and built over the precise location of the former District line platform. Ah well, nothing to see here. Two sets of tracks run south from South Acton station, both of which lead immediately to level crossings, which is very rare for nearly-central London. But there used to be three, the third being the spur line we're focusing on today. It's completely vanished, although it would have run through the allotments at the end of Stanley Road, and they're locked - firmly gardeners-only. An old block of flats stands empty alongside awaiting demolition, windows smashed, and a single light fitting dangling bare from each abandoned ceiling. The invisible track continues through an industrial estate, past the site of the former Express creamery and milk bottling plant, although business is more tool hire and auto services around here now. And then finally, at the junction of Colville Road and Bollo Lane, there's something to see. This spur line didn't have a level crossing, it had a bridge, and the brick abutment survives. One side's straight, the other side's curved, and a single pillar rises up from the top where the tracks once ran. 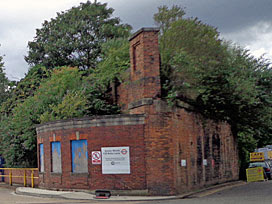 It's a substantial remnant of redundant infrastructure, which I suspect has survived because it stands at the entrance to London Underground's Acton Works, a Tube Lines depot catering for the needs of railway stock. Indeed most of the long strip of land between Bollo Lane and the railway embankment appears to be taken up with train-related offices and workshops, so there's no further visible trace of the South Acton branch line's progress. Until Acton Town, that is, the station at the end of the line. This has four platforms but it used to have five, and platform 5 is where the runty train from South Acton used to stop. If you look, there's still a footbridge from ticket hall level, but you can't get across that way any more. Instead the closest you can get is looking across from platform 4, the eastbound District line platform, from which there are clues. A strip of grass by the fence, gradually widening the further along you walk, that's where the old tracks used to run. As for the old platform, that was only short, and now lurks behind the screen of advertising boards near the footbridge. That's now part of Bollo House, the Piccadilly line's western HQ, so you're not going to see it unless you join the crew. And you're never going to travel along this former bit of the District line either, far too much of it's been built over. Should Acton Town to South Acton ever be a connection you need to make, the quickest way's probably to walk.